A box in a box effect. Yesterday I received not one, not two, but three boxes in the mail. All were filled with cat food and we didn’t pay for any of it! Can you believe it? When I first started blogging, I never expected to be getting free food out of it. Sure, I expected to rise to celebrity status but I didn’t think humans would be showering this little ghetto kitteh with noms. I expected to be hitting the talk show circuit and in all the newspapers—and I don’t mean the police report. I used to like boxes a lot more than I do now. Now I’m a little more careful about which boxes I climb into. That said, I didn’t jump into any of the boxes. Maybe it had something to do with TW’s camera sitting there like a weapon. Is there a flashy box? Is the coast clear? Today, my gut rot came from Petco. I did jump into that box but this photo is file footage. TW couldn’t get her flashy box quick enough today. I keep her on her toes. She didn’t expect me to jump into the box while she was putting the food away. Since I’ve been wordy this week, I decided to keep this one short. I’m sorry TW hasn’t been letting me visit as much as I’d like. She’s trying to do something called cleaning. HAH! Isn't being a kitty blogger pawsome? Do you listen for the man in brown shorts to come too? How awesome that you are getting free gourmet meals for all your hard work, CK! BOL you got food in the post??? CK you are one lucky kitty. Happy Box Day to you and enjoy your day of boxes we say. Paws up for free food, CK! That's what we call having blogging really pay off! Wow, free food! That's pawsome! 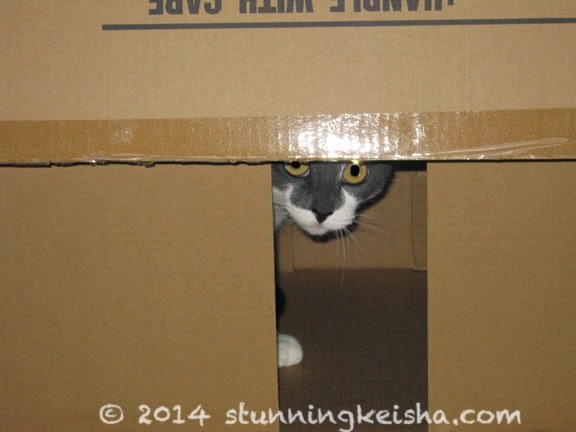 Food boxes are the best CK and this was a fun post! WOW....food delivered to your door..from your adoring fans? Not a bad deal...I want a piece of that action! Happy Box Day......no doubt you'll have plenty to choose from. ck...ya mite knotta made de 6:00 mews but there IZ CK merlot...yea, tell thoz sponsors out ther they missed out on that big time....jack azzez....any way grate fotos !! heerz two an Antarctic cod kinda week oh end !! Wow! Food and boxes! What more could a ghetto kitty ask for? Happy Box Day, CK! Three boxes? My mum couldn't even get me one so I had to make do with old photos. Dat's pawsum dat yous get so many good noms sent tu yous house. Yous look gweat iin yous box. that's great for you CK! Eat up! SCORE on the boxes, CK! ....Glogirly's been doing lots of that annoying cleaning too. Getting free stuff is PAWESOME! Especially when it's yummy noms. Cool box photos, CK! I think that the World's Most Stunning Cat should get all the free food she can rake in. You go girl. M likes that idea you gave us on my blog. Now the box you have I call a good one. We especially love the boxes that come filled with noms! Oh! Mes LOVES that Box in Box! What a great piece of ART!And me purrticularly likes yous peeking out of the other box! Boxes with food in them. You scored. More like a box of FULL KITTY! Nice! Free food?! That's our favorite kind of box-filling stuff, CK! I don't rate. But that's OK. Mommy buys it for me anyway even when I waste. And I do. A belated Happy Box Day! 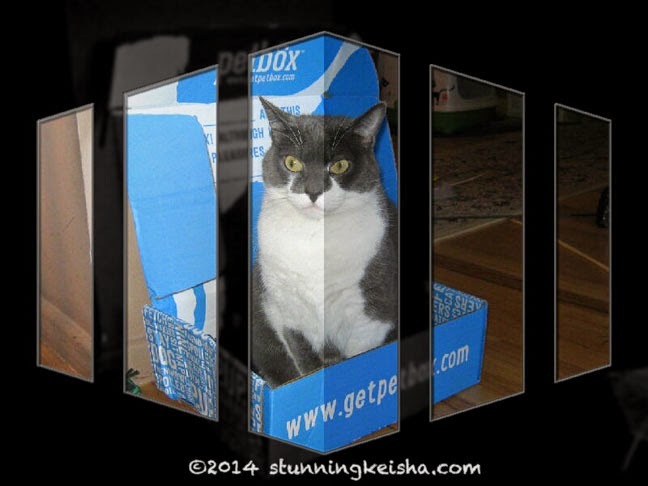 Love both box pics of you CK, but the 2nd one is purrticularly adorable!